Faith is the vision to see things in the Dark and in the Light. Thanks for visiting my blog. It is my privilege to share with you my experience and my relationship with the Lord Jesus Christ. He changed my life and He can do the same in your life, if you accept him as your personal Lord and Saviour. I meet a lot of people who have questions regarding the purpose of their lives. Some have questions as to how they can overcome their difficulties and personal challenges. Through my blog I would like to share my thoughts with the help of the scriptures on how the Lord can help you to overcome the difficult and sometimes impossible situations you face. In the series 'Key to Life', I share different topics which people face in their daily life. I hope the topics in this series will help you. I believe you are very important to the Lord Jesus Christ and I pray that the Church I attend would be a channel of blessing to you. Its doors are wide open to people from all backgrounds, languages and profession regardless of where they are in their spiritual journey with God. 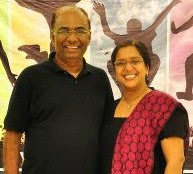 The Church serves the community at Thane through worship, counseling, bible studies, seminars and a network of small group meetings in local homes. Come join us as we meet on Sundays and at various centres during the week in the city of Thane.